Rickinghall Inferior, and its neighbour Rickinghall Superior, are names that seem to have stepped straight out of the pages of a Thomas Hardy novel. The names mean 'Lower' and 'Upper', of course, not a distinction which needs to be reached for in many East Anglian villages. The Rickinghall Superior church is up on the hill beyond the bypass, mean, moody and redundant. The Inferior one is down in the centre of this trim, slightly suburban village, which stretches for a couple of miles along the A143, becoming Botesdale and the parish of Redgrave before you realise it. Rickinghall Inferior church is strikingly pretty, like a pretty girl whose eye you catch in the street; lush and ornate, it almost seems to flutter its eyelashes. Partly, this is because of the delicious topping out of the Norman tower, turned into a Decorated wedding cake in the early 14th century. The strong aisle and long porch accentuate a sense of voluptuousness, with their ornate decoration, some of it Victorian. The gorgeous porch, with its elegantly arcaded and seated open windows, is the icing on the cake. Stepping inside, I was instantly reminded of the interior of the church at Thelnetham, a couple of miles off. 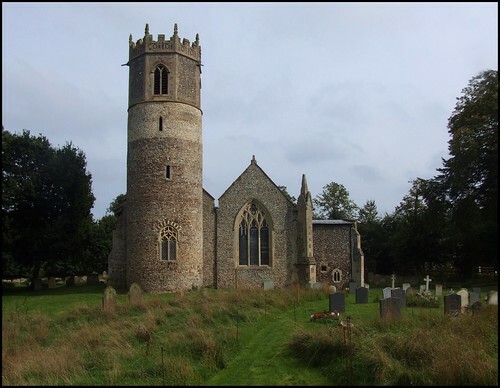 From the outside, the commonality is not so obvious, because Thelnetham has a square tower, but the interior is strikingly similar, with a wide south aisle, as wide as the nave, and an ornate piscina set in the south-east corner of the aisle. Both churches have a most unusual feature, carved tracery in the east windows, and it seems reasonable to assume that the naves, aisles and chancels of both churches were built by the same masons to the same design, at roughly the same time, against existing towers. Unfortunately, Rickinghall Inferior drew the short straw when the 19th Century restorations were being handed out. While Thelnetham's came under the reasonably safe and steady hand of Diocesan Architect Richard Phipson, St Mary fell under the heavy gaze of JC Wyatt, who unfortunately rather anonymised the interior. Everything is pretty, but heavily restored. The reredos is made of medieval panels, but they are too short to have been a roodscreen dado, and so may well have originally fronted the rood loft. They are painted in a medieval style, which is interesting, and more successful than the fairly dour 19th century Way of the Cross in the east window above. More interesting, however, is the question of where the panels went between the destruction of the rood loft in the 1540s, and the construction of the reredos more than 300 years later. Did Wyatt find the rood screen still in place in the 1850s, or had the panels been pressed into use for another purpose in the meantime? Or did they come from another church altogether? Another intriguing detail is the font. As is familiar from the first part of the 14th century, it has arcading carved with window tracery, including an exact copy of the chancel east window. However, it was never finished. The natural conclusion is that the work was interupted by the Black Death, but it does suggest that during this period the fonts were bought uncarved by parishes, and then the designs were added in situ. There are a couple of nice panels of Flemish glass, probably 18th Century, which appear to depict the disciples at the Last Supper. As in many Suffolk churches, the millennium project here was a stained glass window, an image of Christ the Saviour of the World, placed in the east window of the aisle, and signed Eckersley in a snail. Having moaned about the glass in the chancel east window, I was pleased that this one was like a breath of fresh air, but I can't honestly say that I thought it was particularly exciting. There does seem to have been a loss of nerve in the design of stained glass in recent years, perhaps the fault of those commissioning it. Dramatic abstract forms seem to have been replaced by increasingly safe naive figurative art, and although the window at Rickinghall Inferior doesn't stoop to a secular subject like some, it doesn't fire the imagination as, for example, Surinder Warboy's treatment of the same subject at Chillesford does. Still, local people that I spoke to seemed to like it.